Also Called: Dusty false nightshade. Stems: Prostrate to ascending, 2 to 12 inches long, much branched, densely hairy. Leaves: Alternate, simple, short-stalked, broadly lanceolate to rhombic, 1 to 2.5 inches long, 1/4 to 3/4 inch wide, grayish-pubescent, sometimes glandular-sticky; gradually tapering to narrow bases; margins entire or divided into narrow lobes. Inflorescences: 1-2 flowers in leaf axils. Flowers: Stalked, about 1/2 inch across; calyces bell-shaped, 5-lobed; corollas 5-lobed, creamy white to greenish white, sometimes tinged purple with a slightly darker star-like patch radiating from center; stamens 5, small. Fruits: Berries, 1/4 to 1/3 inch in diameter, enclosed by enlarged calyces; seeds numerous, rough, flattened, kidney-shaped. Habitat: Dry prairies, pastures and roadsides, in sandy or rocky soils. Comments: This low plant can be easily overlooked. It often has dirt and sand stuck to it, giving it a dusty appearance. 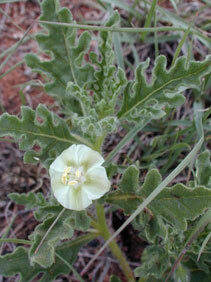 It is sometimes referred to as "prostrate ground cherry" but is not in the genus Physalis. The name chamaesaracha is derived from Greek "chamai", "low" or "on the ground", and "saracha", for a Spanish monk and botanist named Isidore Saracha.